The earliest of my guitars still in my uninterrupted possession (I bought the Shaftesbury plexiglass model earlier, but it was out of my possession for 25 years). Around ’71, I was listening to a lot of Genesis and Dave Mason’s solo albums, both of which had lots of very detailed and silky 12-string parts. One day, we booked the early Genesis to play at our school and I got to spend some quality time with the delightful Steve Hackett, who had replaced original guitarist (and 12-string specialist) Anthony Phillips a few weeks earlier. It was about his fourth gig with the band. Phil Collins had even more recently replaced original drummer John Mayhew – didn’t he do well? Although the band’s founder members were in the middle of one of their many famous arguments, Steve very kindly and patiently guided me between the Hagstrom he was playing and the other viable contemporary choices, Levin and Epiphone, Martin being unaffordable. I got my dear old dad to buy me the Epi for Christmas, and it was a great choice from which I’ve never looked back. £60 from Sound City as I recall – thanks, Dad. Despite being made cheaply under licence in Japan with laminated sides and back, it has retained its tone and the neck remains slim and true, the action very fine. Until Russ Wootton made my next 12-string for me, I had never played another 12-string which I liked a quarter as much. It was retrofitted with a Baggs i-beam under-bridge transducer a few years back, about which I’ve always mixed feelings and will eventually replace. But 12-string acoustics are notoriously difficult to electrify – the pickups seem to get confused and jumble up all the exquisite subtle overtones and harmonics. I’ve owned it continuously for over forty years now and it’s in absolutely in mint shape, with original cheapo yellow plush-lined black hardcase. One of my mates has one shown here with mine, a year younger, just as good to play, almost as good shape. An unknown classic imho. Just saw your link regarding your Epiphone FT-165. The guitar looks fabulous. I’ve always loved that model even though, as you say, they are know for being cheaply made. I was just curious about whether you had ever had any issues with the neck coming loose from the block in the guitar? I recently purchased an early FT-165 that was in great shape except for the neck. It was in such good shape that I’m sure the neck must have come loose early on and it just sat in a case since the early 70’s. I also wanted to add a pickup to it. After doing some research I puchased a Fishman Matrix Infinity undersaddle pickup. I had the adjustable saddle removed and plugged with a new piece of Rosewood and re-routed out a standard 1/8″ saddle. The Fishman pickup was mounted under the saddle. The neck was reset and shimmed to lower the action. Now that its complete, the guitar sounds great. Do you tune yours at standard concert pitch or tune it down and capo it? Thanks for your post. You’re absolutely right – about ten years ago, when the guitar was about thirty years old, the big block inside the body into which the neck bolts began to come loose from its surroundings. The neck angle changed for the worse and then the top around the neck began to show signs of buckling, so I sent it straight to Russ Wootton for a repair and a few weeks later it was back to normal, good as ever. Turns out the original glue had just given up. I tune it normal, D’Addario 10-47/27’s on it right now but changing to Elixirs next time as they now make the same gauge and I prefer Elixirs because they stay clean and keep their tone longer, essential if you look after this many guitars by yourself. As to pickups, 12-strings are notorious for producing a complex signal that most pickups can’t really handle. My Russ Wootton is equally problematic and my Rickenbacker 360/12 electric is very fussy about the amps it will play through. After extensive research, I had a B-band installed under the bridge several years back and it’s ok but a bit thumpy and compressed. Later I bought the fantastic Fishman Rare Earth Blend soundhole pickup which I migrate around my guitars but it won’t fit this guitar because it’s too deep for the quite shallow space between the strings and top (common to many older Epiphones). For recording any acoustic guitar, 12-strings included , I have never used anything nearly as good as the DPA 4099G clip-on gooseneck mic which a friend of mine happens to import to UK. But it’s fabulously expensive, very delicate and feeds back well before an optimal loudness is reached. Most capos don’t work too well on 12-strings, either allowing the thin strings to rattle or putting things way out of tune. Try a G7, I’ve had a lot of luck with them and now have a few. Enjoy the FT-165, one of the greatest unsung cheap guitars anyone could ever wish to come across. 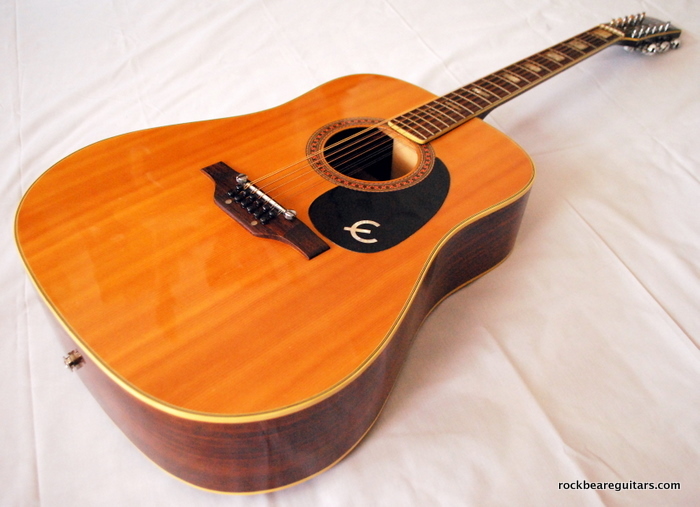 Stumbled here just browsing around looking what others had to say about the Epiphone FT 165. I’ve got two good ones, and a couple in bits I’ve acquired along the way. Bought my first one in 1971 from Dawsons. I think I paid a bit more than 60.00 quid; more like 65 – 70. Later 70’s and a luthier replaced the tuners with some Gibson ones; the old ones were getting really stiff. Bought my second FT 165 in about 1973. Still has the same tuners, but one or two are getting a bit stiff. Luckily I’ve got a spare set on the end of a FT 160 neck somebody (not me) once planed down to try and attach it to an electric body. 40 years and they’re still playing fine. Five or six years ago I had the neck blocks re-glued on both guitars. They’d come loose with the familiar worsening action that only Epiphone bolt-on-neck owners can appreciate. My earlier FT 165 has been played the most by a long way, but hardly ever kept in a case in its earlier days.. The later one has been played very little by comparison, but nearly always stored in a case. 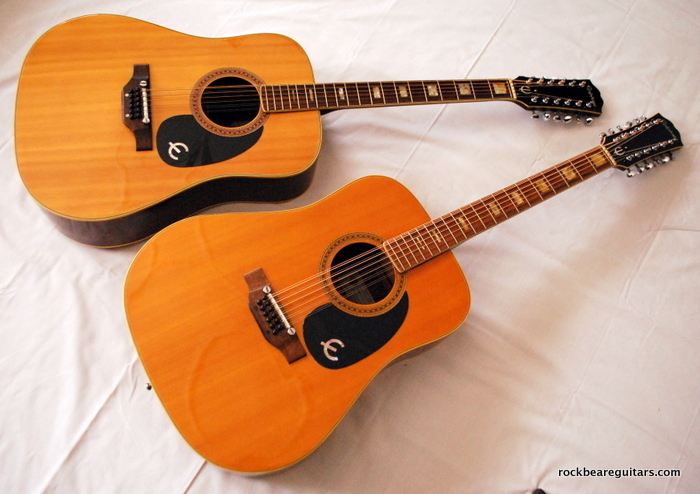 Result – two very playable guitars, sounding slightly different to each other. I also play a Guild and Martin 12 stringer, and the Epiphones can both hold their own in their own way. Not sure about cheap at the time; 60 – 70 quid was more than a month’s take home pay for me then. I’ve tried every capo there is. I use a Kyser 12 string one on my Martin, but – like all spring based ones – it’s starting to weaken a bit. Shubb are OK – I’ve got one in most of my 12 string cases, and I also use the Planet Waves one with the microadjustment; the Epiphone necks are a bit thin for that capo. I’ve never had much luck with the G7. Both of the ones I’ve had, the clutch has worn out. Thanks, Sam. Good to find another enthusiast. 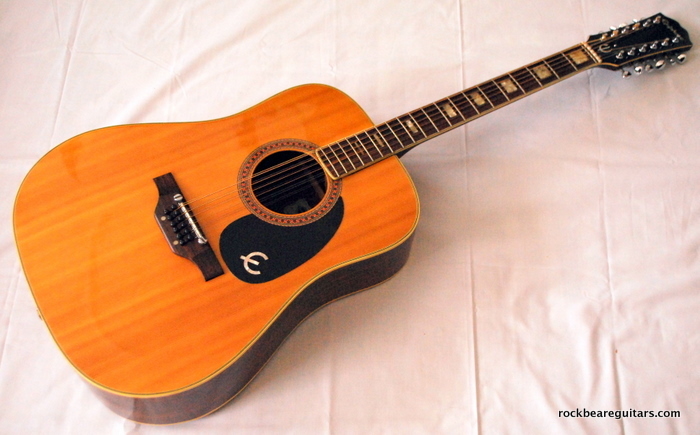 These Jap Epis were and are seriously underrated – the laminated tops sometimes go dead, but from my experience this seems to be more of a problem on the 6-strings than the 12’s. My comments about Â£69-70 being cheap was relative to the price of my first Gibson electric, the subsequently discredited ’72 SG De Luxe (stencilled pickups, volute, skinny neck, cost-saving body contouring and front-mounted control panel – all yuk) which cost my Dad Â£220 of his hard-earned British pounds at Selmer’s in Charing Cross Road. (The sales assistant was one Amancio D’Silva, a great jazz player). I don’t capo my 12-strings much but find my G7’s work pretty well unless I bend strings. Enjoy your Epi! I’ve owned an FT165 back in the seventies. I had bought it in 1972 because I liked the sound of 12-string guitars in the first place. Don’t know how much I exactly paid for it, but it was quite affordable. I think it was around 6000BFR at that time (which was about Â£100). I was stunned by the overwhelming sound and I took it everywhere with me for years. Extremely though guitar. Alas, I did sell it somewhere in the early eighties because, due to a lack of time, I used to play less. Now, I would die for one because it was the best 12-string I’ve ever had. I’ve tried a Norman B20-12 and recently a Simon & Patrick Woodland, but they aren’t half as good as my Japanese Epi was. A few months ago, I acquired an Epiphone G1275 doubleneck: it immediately felt like coming home to the former FT165 I owned before. The playability of the 12-neck is great, but still, it remains an electric guitar and I prefer my 12-string guitars acoustic. My luthier – KGB in Birkenhead, and I don’t think they come much better – can reglue the neck block, do a set up with strings for around 60 quid. It’s a shame about the Norman B20 12 stringer. I’ve also got one, but overall it doesn’t compare very well with any of my other 12 stringers. When I think it’s a solid wood guitar, built in a country where they’ve got a mammoth choice of home-grown woods, I’d have expected better. It’s nice to hear all these fond words about your FT-165s. I was given one a while back and thought about throwing it out because it’s in such bad shape. Loose neck block and someone thought they were fixing it by driving finish nails into it. Also the top is in sorry shape as well. I’ve been reading up a bit about what it would take to attempt a repair myself. I think I will give it a go considering I would probably never pay what it would take to make it right. Hopefully I will end up with something playable. Unless you’re very handy, I would not recommend you attempt the repairs you refer to. I certainly wouldn’t – perforated neck blocks and damaged tops are the domain of skilled luthiers. They will almost certainly cost more than the guitar is “worth”. The question for me would be “where can I find a better-playing 12-string and how much would it cost”. My answer would be a Taylor, and well over £1000. I hope you do the right thing and spend a couple of hundred on restoring it! I appreciate your concern for the scale of expertise it would take to make this guitar right again. I am very handy and have an epiphone Dove that I play daily and love to death. Considering that this guitar is in such a state of affairs that it is destined for the trash heap. I figured that it would be a fun learning experience and probably a low dollar project to cut my teeth on before I attempt any major repairs on one that I could actually make worse and loose my investment on. Sound reasonable? or you still think it would be a wast of time. I’m hoping that if the project goes south on me that it would still have it’s worth in the experience. Het, Brent. If you’re handy enough, I think it would be a great idea and if you’re successful you’ll end up with one of the most exceptional 12-strings ever made imho. The necks on these things are unusual in that they play really well and since they’re bolt-on, if all else fails, you’ll still have a great neck you can work with. Good luck. Thanks, I appreciate the encouragement. Since my last post I have investigated further and this is what I have found. Wish I could attach some Pics. Truss rod locked up. worn frets and fret board, binding on the neck has cracks at almost every fret, cracked saddle and I just found out that the cracks in the top that I thought were just in the finish appear to be in the top. You can’t see them from the inside but upon bringing the finish down to bare wood they won’t sand out with 220 grit. I was hoping that dirt had just settled into the cracks in the finish and migrated to the surface of the top. No such luck. I’ve since removed the frets ,and fret board and freed up the truss rod. Could be a good neck again. Now I’m debating on if I’m going to put a new top and binding. A lot of work but I’m enjoying the heck out of it. Love all the positive feedback on the Epi FT 165’s . As it turns out I was lucky enough to stumble upon one of these gems about a month ago. The original owner never played it and used it basically as wall art for the past 20 years . I picked it up for 100 bucks and a good friend who also plays and repairs went through it for me. He repaired two loose braces near the sound hole and replaced the bridge. He also shimmed the neck slightly. The action is now so good it plays like an electric . The only issue that still remains is trying to keep it in tune as the OEM tuners are pretty well shot ,a lot of slop and play in at least 3 of them . Would you happen to know where I can find either replacement tuners or individual parts so I can have them rebuilt . I’ve searched the web and am not having any luck so far . Any comments appreciated . Thanks, Ben. I completely agree – set uo right, these things play so easily for a 12-string. I think you may have some difficulty in finding replacement tuners. But given that the value of these instruments (or indeed pretty much any 12-string) is not particularly high, I’d suggest you source some the better tuners that are now available and would sort your tuning problems in a trice. I suggest you get someone like Allparts or WD to recommend something that will fit the headstock and pegholes, and preferably even the fixing screwholes? Thanks for the input I am really concerned with keeping the integrity of the instrument in tact so I’m hoping to find something that will keep the same footprint as the oem tuner. I can Tell you one thing, I certainly will never part with this guitar , as soon as I saw it I had to have it! Thanks again for your help . Where did you get the idea that these are made from ‘cheap laminated woods’? They were made in the Far East yes but the top is definitely solid yellow pine and as near as I can tell the rosewood back on mine is solid too. I f it’s ply, then it’s ‘faced both sides’. A great tone although mine is suffering a little belly ache after all these years; I’m the fourth owner after my dad. Thanks for your comment, Jack. The language in my comment is too loose and you’re right about the top though the sides and back are definitely laminates. I’ll tighten up the comment. Mine also suffered some bellying but it can be corrected. 12-strings are prone to it because of the enormous string tension, so I now store mine detuned, a nuisance but a practical preventative measure. Enjoy yours! This guy seems to think different. The Japanese-made FT-165 never carried the Bard name any more than its six-string equivalent carried the already-iconic Texan designation. I’m pretty well-connected amongst high-end collectors and have never heard of this fellow, but despite his claims to be a collector, if he can’t even get an instrument’s name right, I wouldn’t have much confidence in his description of its materials. What I do know is that I had a pickup installed in mine several years ago. That involved reaming out the endpin to install an endpin jack, and gave access to a cross-section of the side wood. How about you drill a hole in yours to prove the point? Thought not! Since my last post, I’ve found another FT 165. This one came with its – allegedly – original case. ; the case looks old and tatty enough. The guitar also came with the usual Epiphone bolt on neck problem. The glue had dried out and the neck block had shifted. The guitar had been stored in a loft for twenty or thirty years. Other than the neck block, the FT 165 was in really, really good condition. KGB sorted the neck block and the guitar plays and sounds great. One or two of the tuners are starting to get stiff, but filling them with grease does help a bit. Cost pf the repair was £65, and this included a set of D’Addario 10’s. A good test of a 12 stringer’s tuning and intonation is the opening riff of the Beatles song I Feel Fine. Don’t know the guy down South with the Epiphone, but he sure wants a lot for it. I’ve always believed the back and sides were laminates, and the top spruce or pine. All three FT 165’s look identical, except for the logo on the pick guard. On my original 1971 model it’s slightly larger than the 1973 and 1975 models. Thanks, Sam, interesting info. Sound like you’re amassing a nice little collection of these things. I have an old Epi 12 string, as per your FT it also has the unusual fret directly below the nut – something I have never seen before. It is a Texan ref FI 160N. 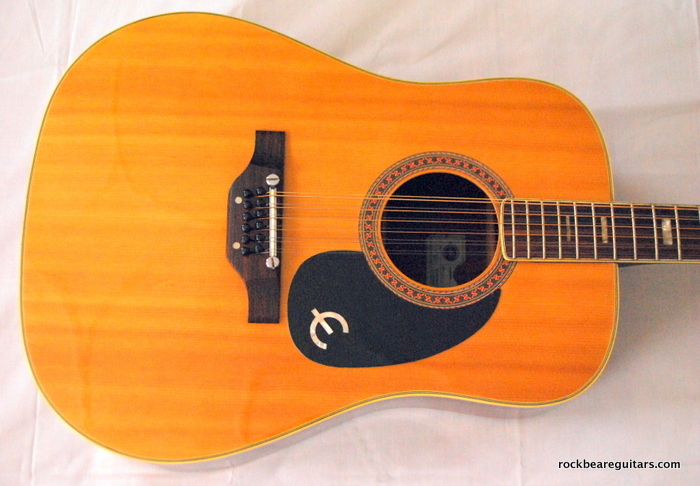 As with you, I have played a lot of different 12 strings, some very expensive, but I have never found anything as good as my Epi for both tone and playability. Have you heard of a FI model? 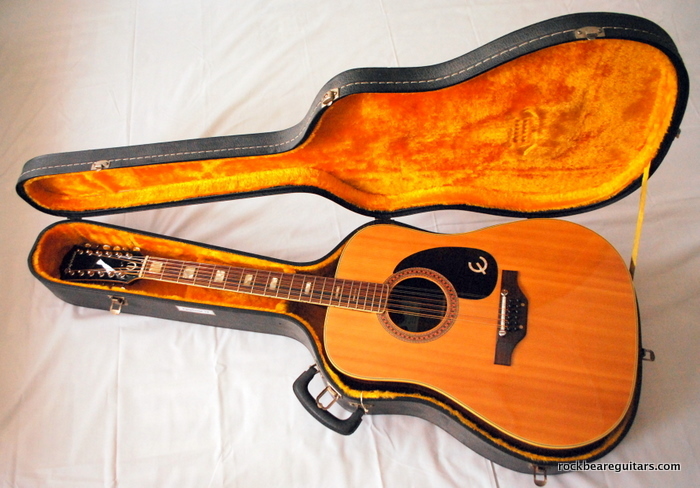 Hi, i have a epiphone 150 in great condition for sale with case if you are interested? Thanks but no thanks. I played quite a few of these back in the day and found them as unremarkable as their 12-string counterparts are remarkable. I think it’s something about the string tension and neck profile, which makes the 6-strings feel and sound rubbery whereas it makes the 12-strings forgivingly playable. Good luck with your auction. No, though I don’t really study these things. The F1 designation is likely to be a misprint of the standard FT designation, and 160 models were common and came just after just after the 165 I have. Most of these Japanese-made models have a zero fret, which make manufacture much easier because you only have to pay attention to string spacing and not slot depth when you cut the nut. Not trying to hijack the thread, but we just picked up an FT160N for my son. Seems to be in great shape and sounds excellent (for $70). Can’t tell if the sides are laminiate, but the top looks solid – is it not…?? Also, most of the pics I’ve seen show the Epi name on the headstock in ‘white’, but this one is definitely abalone… ?? All in all, he’s extremely happy..!! Thanks for any input. Good price, well done! There has been some debate on my site as to whether the tops are laminate or not – mine is. and the headstock logo is abalone. Sounds like you’ve got a good deal there. Enjoy! I’d always assumed the tops on the FT 165’s and FT 160’s are solid (spruce or Pine), but Rockbeare is correct; they are laminated tops. The one I bought last year was in great condition overall, but – as I said – with the usual shifted neck. When the neck block shifts, it tends to allow the top end of the fret board to push in the body just in front of the sound hole. My older two weren’t too bad, because I’d owned them since their earliest days and I had control over how much damage I’d let the shifted neck block do (try playing them, anyway). 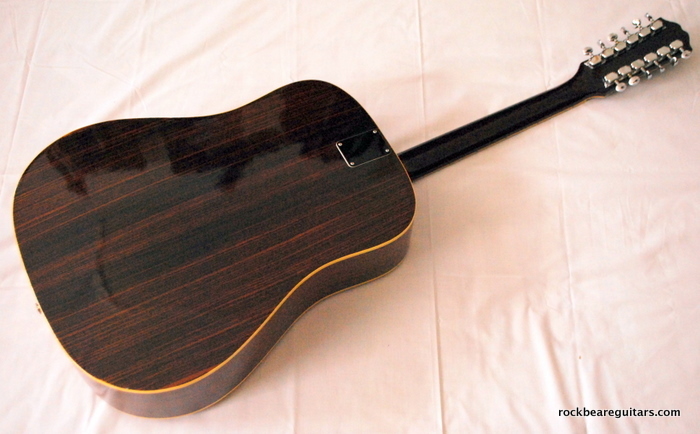 But on the FT 165 I bought last year, the fret board had pushed quite hard into the body in front of the sound hole. KGB repaired it, but at the time I wasn’t too worried about complete restoration of the body around the rear of the sound hole – so I took the opportunity to have a quick look last week. Looking closely, you can see that top around the sound box had cracked in the way that only plywood can crack. Laminated top: definitely. I learn something every day, even at my age.